Shake the tanks before spraying! Use a domestic heater to warm the cylinders in a small room overnight, or place them in a warm airing cupboard overnight to warm up. Remember that the room needs to be at least 30 degrees centigrade in order to get the foam tanks up to this temperature. Alternatively, the tanks can be warmed up in a tub of warm water. The water should be at body temperature. Do not be tempted to use hot water. Remember, both tanks must be at the same temperature, as this ensures the viscosity of the 2 components are at a 1:1 ratio. Why is the temperature crucial? The foam chemistry works best if the tank temperature is between 24 and 30 degrees C (75-86 Farenheit). Below this temperature range, or if both tanks are at not at the same temperature, one of the tanks will empty faster than the other and you will not get the maximum amount of foam out of the kit. 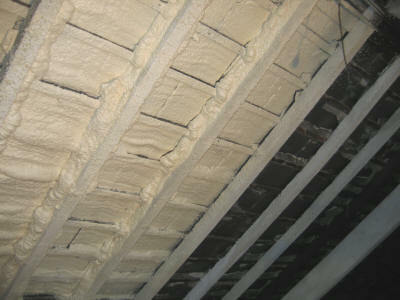 Foam quality will also deteriorate. If the temperature of the tanks drops below 24 degrees celcius whilst spraying - immediately stop and re-heat the tanks. This is crucial to ensure trouble free operation of the spray gun. The foam begins to cure or harden the moment the 2 components are mixed (this happens in the nozzle). Change the nozzle at least every 5 minutes (if spraying continuously), or if you stop spraying for more than 30 seconds. 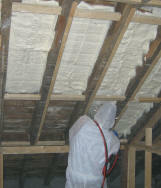 When you stop spraying (even if it is only to move a ladder) the foam continues to set in the nozzle. If you attempt to continue spraying after stopping, you risk causing an irreversible gun or hose blockage. As the guns and hoses are not serviceable, a blocked one means the gun goes in the nearest skip. If you choose to clean the nozzles with acetone, they must be submerged in a tub/container of acetone immediately, as this will clean it. Acetone is available from our product page. Obviously cleaning the nozzles is the most economical method, but it must be done immediately, before the foam sets. The nozzles are made from a semi-translucent plastic, so you can see how effective your cleaning is. As you would do with painting, wear protective clothing (overalls & gloves), eye protection and a dust mask (these are available on our product page). Cover floors, carpets, furniture etc to protect them from over-spray. Ventilation is important. Open windows and if necessary use a fan to push air into the room. Spraying Foam is similar to spray paint. Start off with a thin layer and build up as needed. Remember that the foam expands before hardening. A layer of approximately 1/8" will expand to around 1 inch. The foam flow is controlled by how much you depress the trigger. For good even results, don't pull the trigger more than 1/4 - 1/2 way and hold the gun approximately 30cm (12") away from the surface being sprayed. Close the tank valves and leave the gun/hose assembly attached to the tanks. Leave a used nozzle attached to the gun. The reason for this is the A-component will react with moisture in the air and harden. 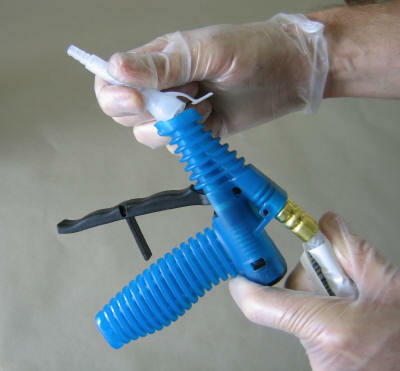 The used nozzle will provide a good airtight seal on the gun. The kit can be left in this state for up to 2 weeks without needing to be cleaned. This used nozzle must be disposed of when you re-use the kit as you will not be able to clean the nozzle with acetone. Clean the gun/hose assembly only with approved cleaning oil. How do I check that the gun is OK?